Welcome back to cookie dough week! If Monday’s posts we’re enough to get you grabbing you favorite mixing bowl, today’s recipes sure will. 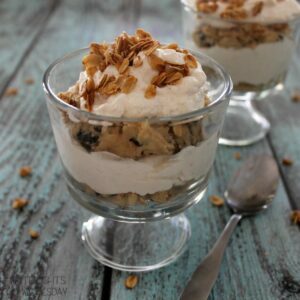 Especially my Oatmeal Chocolate Chip Cookie Dough Parfait. Yeah, I went there. 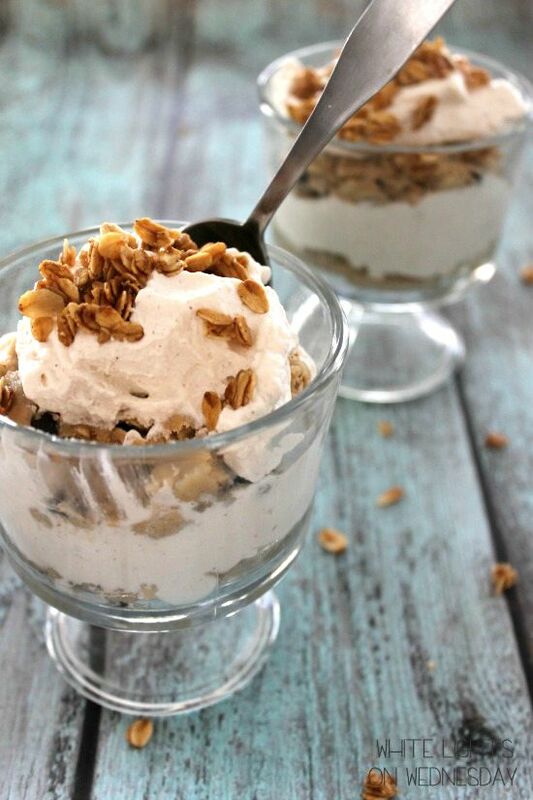 So this parfait is kind of amazing. Not to toot my own horn, but I’m in love. It’s in your face cookie dough, but nice and light from the cinnamon whipped cream. I’m going to make these forever. If I’m having a no good, very bad day this is dessert I want to make everything better. 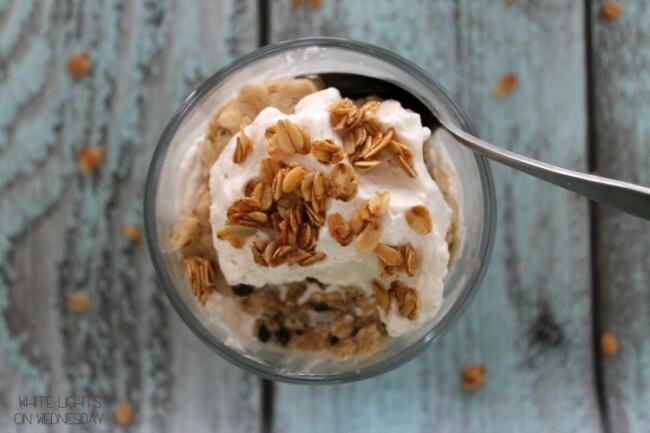 This parfait is everything I love about oatmeal chocolate chip cookie, but without the wait to make batch after batch of cookies. Mini chocolate chips, rolled oats, cinnamon, cookie dough – yes! Seriously comfort food in a glass kids. And this dessert got major points from the littles. They both begged me for a bite while I was photographing and once I ponied up, there was no getting the parfait or spoon away from them. Heck I was eating handfuls for just the cinnamon maple granola. SO freaking good! Please tell me you’ll make these as soon as you can. Then we’ll be besties. 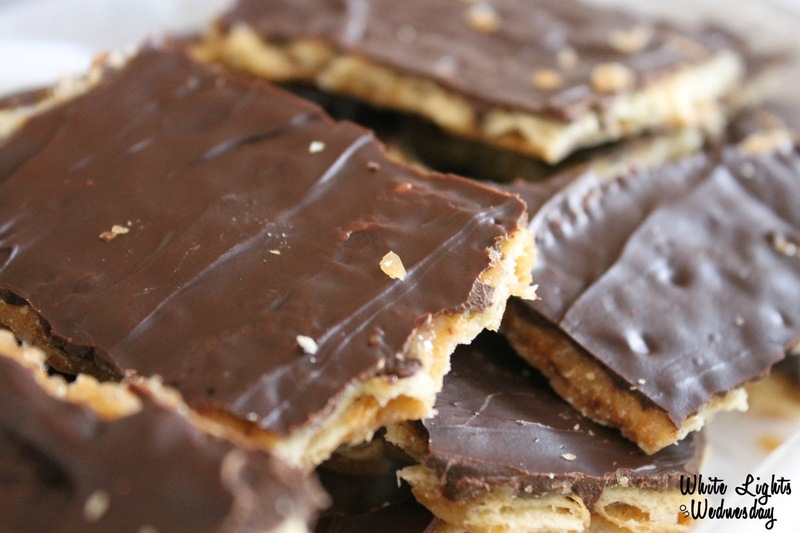 Check out all the cookie dough week recipes being shared today. In a large bowl beat together butter, sugars, and vanilla until well combined. In a medium bowl, mix together flour, baking soda, salt, and cinnamon. Add dry ingredients to wet ingredients. Mix to combine - the mixture will look really dry. Add milk, and mix until just combined and cookie dough is moistened. Mix in chocolate chips and oats by hand. Set aside. In a large bowl, beat together ingredients until still peaks form. Do not over beat. Place 1/4 of the cookie dough in the bottom of a small serving dish. Top with 1/4 of whipped cream. Repeat layers. I flattened out the second layer of cookie a bit before placing it in the dish to keep it from smooshing the whipped cream. 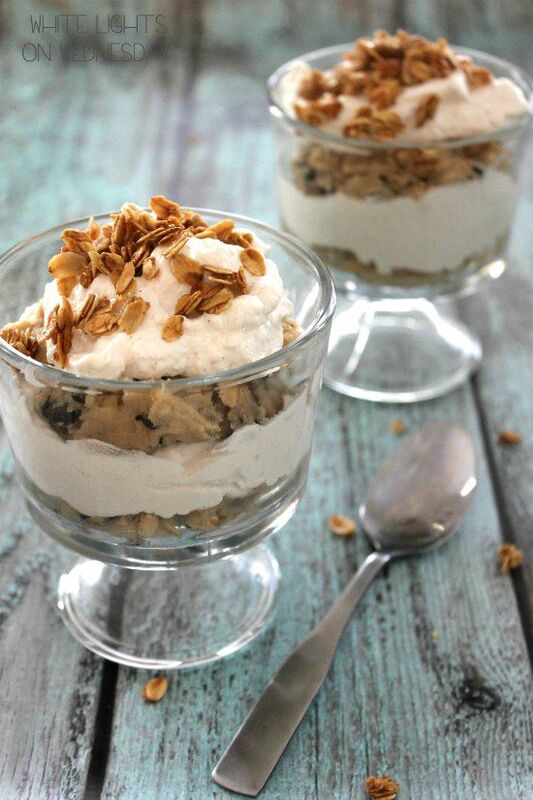 Sprinkle granola on top of the second layer of whipped cream. Repeat for second parfait. 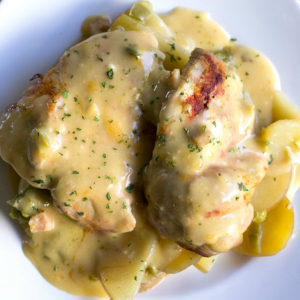 Serve immediately or store in the refrigerator until ready to serve. Mix all ingredients in a medium bowl. 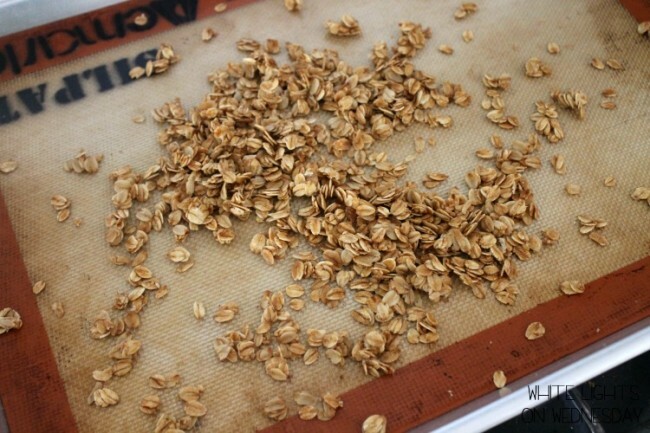 Spread granola onto a Sil-Pat or parchment paper lined baking sheet. Spread into a thin layer. Bake for 25 to 30 minutes, stirring every 10 minutes, until granola begins to brown. Remove from oven and let cool. I can only imagine how good this tastes! I love chocolate chip cookie dough & oatmeal, yum! 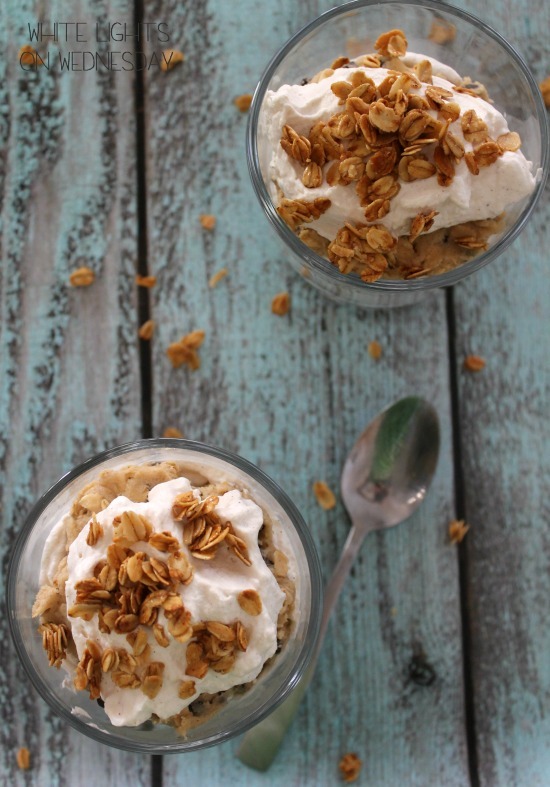 There are so many things I love about this parfait that I can’t even list all of them! I’m going to have to give it a try. Pinned! 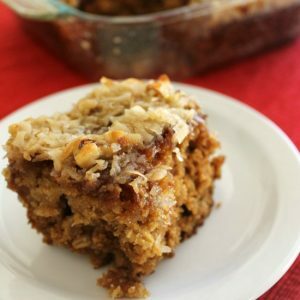 I love the idea of a oatmeal chocolate chip cookie without the work! And that cinnamon whipped cream is to die for! Yes yes yes! The only thing harder to resist than regular cookie dough is oatmeal cookie dough! 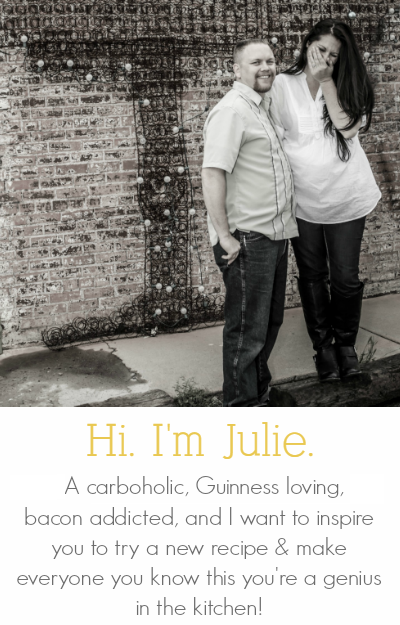 Thanks for participating Julie! Jamie! How did I not know you had a link party?!? It’s going on my list. What day and time (EST) does the party open?